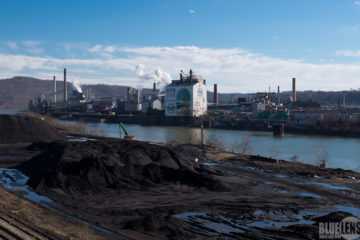 Clairton Coke Works was named the third most toxic air polluter in Allegheny County in the PennEnvironment Research and Policy Center's Toxic Ten report. Photo by Mark Dixon, Blue Lens, LLC. The public hearing for U.S. Steel’s appeal of the $1 million enforcement action levied earlier this year by the Allegheny County Health Department entered its second day on Tuesday, with the multinational company arguing that the penalty is too severe, and even oversteps the legal authority of the department. A spokesperson for the Allegheny County Health Department said that the staff would not be commenting on ongoing legal actions as a matter of policy. Environmental groups following the proceedings told NEXTpittsburgh that the court battle is likely to stretch well into 2019. “From what I see, it’s gonna be a little bit of a long battle,” says Geoff Bland, Pittsburgh community organizer for Clean Water Action. 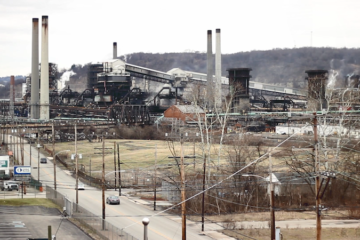 Clairton Coke Works is the largest facility of its kind in the U.S. The site operates 10 different batteries which are essentially ovens that cook specific kinds of coal over many hours to produce materials used in the manufacturing of steel. Following decades of violating the Clean Air Act and opposition from community groups, the facility was hit with the fine and ordered to redesign their facility to meet clean air standards in June of this year. While the company did submit a redesign plan in August, several attendees of the public hearing this week say attorneys for U.S. Steel claim that implementing the plan could cost the company $400 million over time, a burden they consider to be unfair. According to U.S. Steel’s public earnings report, the company ended 2017 with $3.350 billion in cash on hand. Although air quality all over the Mon Valley has improved considerably since Pittsburgh’s industrial era, our region still has some of the worst air quality in the nation. In the last decade, experts and residents around the region have been alarmed by public air monitors showing increasing levels of carbon and sulfur dioxide in our atmosphere. 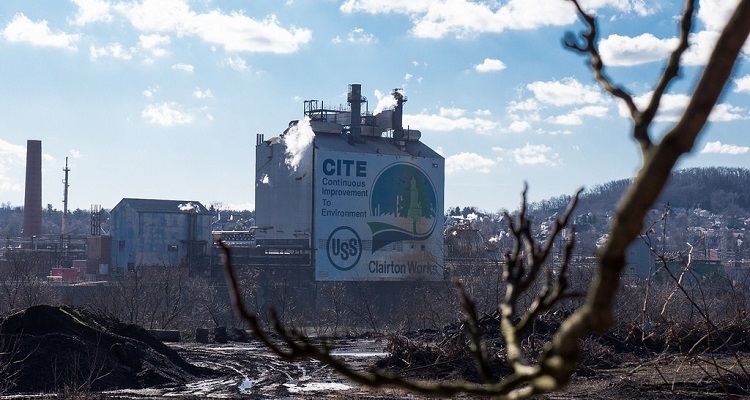 Experts at the Health Department, as well as many environmental groups, say these increased levels are a direct result of the Clairton Coke Works which is high on the list of the top 10 polluters in the region. Speaking to NEXTpittsburgh, Bland says he believes no matter how long the appeal, and perhaps further appeals to the Court of Common Pleas, go on, U.S. Steel will be unable to avoid paying the fine and cleaning up certain aspects of their operations. However, he says Clean Water Action is concerned that U.S. Steel’s consent decree governing clean air standards is set to expire in the first quarter of 2019, which may give the company an opportunity to fold the enforcement action into some new settlement with the city. U.S. Steel has signed dozens of consent decrees on air quality with the county in the last several decades. Because previous decrees consistently failed to stop the plant from poisoning the local environment, many experts and activists came to refer to the agreements as a “pay to pollute” model of regulation. What happens now that Clairton Coke Works has been fined $1 million for air quality violations?